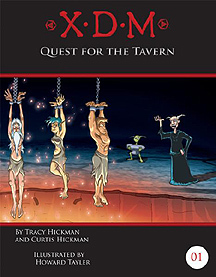 Quest for the Tavern is an original adventure for four to eight X-Treme Dungeoneers and their X-Treme Dungeon Master. This module uses the XD20 roleplaying system as documented in XDM: X-Treme Dungeon Mastery, but any XDM of 5th level or higher can easily adapt the module to their system of choice. You remember the tavern... bizarely. You don't think you accepted any Dwarven ale, but here you are, stripped of your belongings and hanging over a pit ("is that a DRAGON down there?") while some insane sorcerer rants on and on about how his revenge against you will finally be exacted with perfection. Someday when you're on a tavern floor nursing a hangover you'll be able to tell yourself "I've had worse," but you're going to have to fight your way back to that tavern first.